iPads and iPhones: Where would we parents be without them? They help our kids with everything from reading and writing through to learning about dinosaurs and chemistry; they provide a way for them to chat with their friends; and, let’s face it, they sometimes keep them entertained when we are trying to answer some emails or cook dinner! Of course, they have their downsides too. Sometimes it’s easy to forget that these devices that we let our kids play on are fully-fledged, Internet-connected computers. How can we make sure that they’re safe while they’re using them? For that matter, how can we make sure that our devices and data are safe from our little ones’ inquisitive tinkering? In this article you’ll discover 18 things you can do to help kid-proof your iPad or iPhone, and make it safer for your child to use. Let’s start by taking a look at the Restrictions feature built into iOS, which gives you lots of ways to protect your device. Most of the tips and tricks you’ll read in this article focus on iOS’s Restrictions feature, so the first thing you’ll want to do is enable it. Restrictions let you do things like prevent your kid installing and deleting apps; disable in-app purchases; block websites; lock down privacy settings, and lots more. 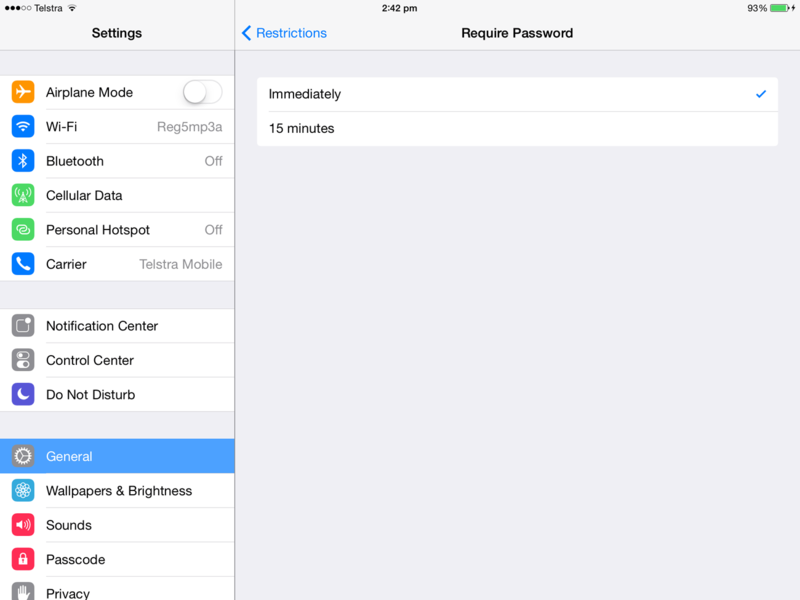 To use the Restrictions feature, you first need to enable it by setting a passcode. 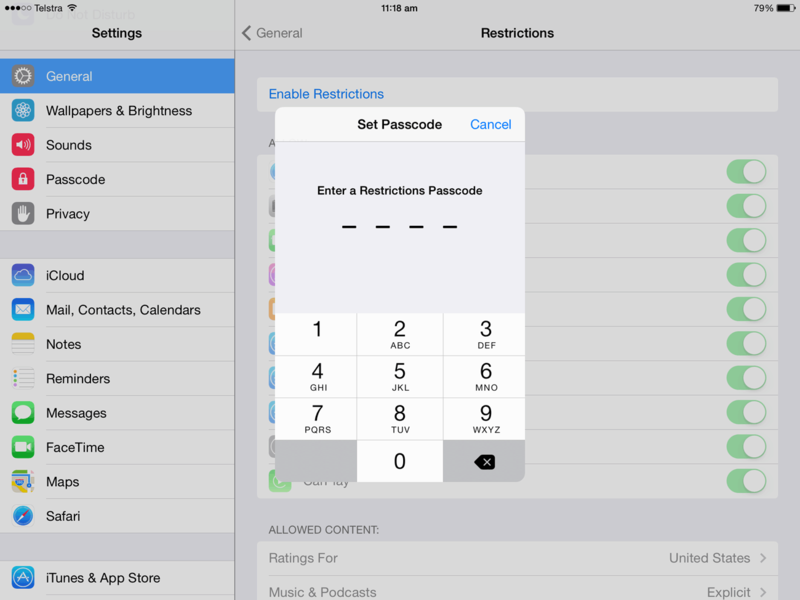 This passcode lets you change the Restrictions settings, so make sure your kid doesn’t know it! You might want it to be different from your device passcode too. Once you’ve set a passcode, Restrictions are turned on. You can change any of the settings in the Restrictions window to enable or disable certain features. As soon as you leave the Settings app, the restrictions apply to the device. If you want to change your Restrictions settings, just go back to the Settings app, choose General > Restrictions, and reenter your Restrictions passcode. To remove Restrictions entirely, tap the Disable Restrictions button at the top of the Restrictions window, and reenter your Restrictions passcode. Be careful with Disable Restrictions! It not only removes the Restrictions passcode, but it also loses all of the Restrictions settings you’ve specified, including deleting all of the websites you may have added under Allowed Content > Websites (of which more in a moment). So only do this when you really do want to remove Restrictions on a semi-permanent basis. 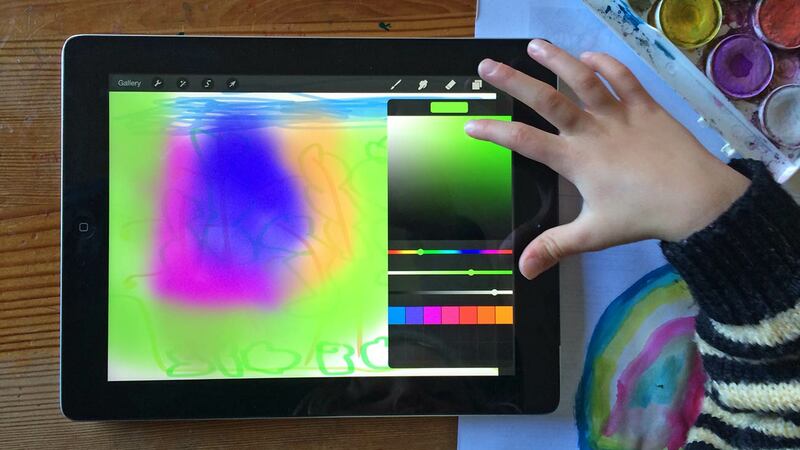 One of the most effective ways to keep your kid safe on an iPad is to use Guided Access. 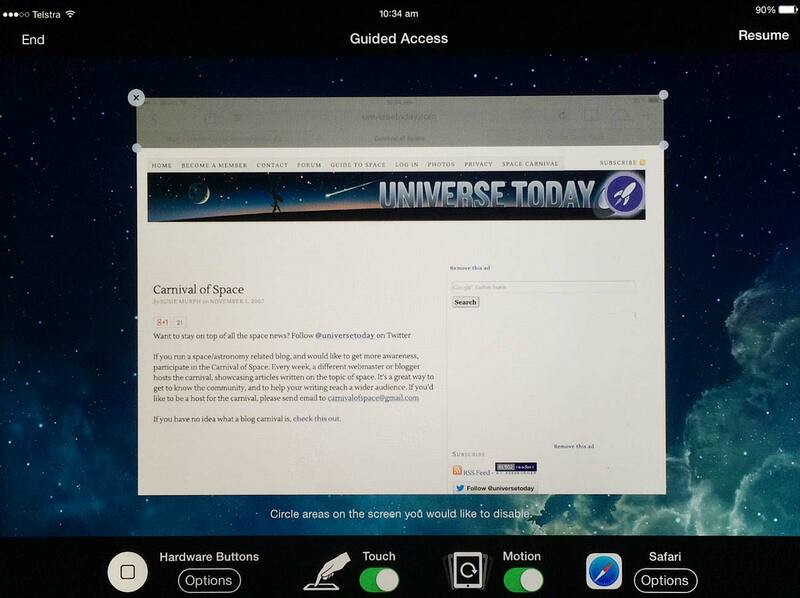 This feature lets you lock the iPad to the currently-displayed app. With Guided Access enabled, your kid won’t be able to close the app, start or switch to another app, or cause mayhem in the Settings app. The downside, of course, is that your kid may become bored with using one app, so this option works best with deep, engaging apps that will keep your kid entertained for more than a couple of minutes. When you open the Guided Access feature, you’ll see various options appear. As well as preventing your kid leaving the app, Guided Access also disables the Sleep/Wake and Volume buttons by default. To change this, tap the Options button below Hardware Buttons. You can also turn touch and motion controls on or off (you’ll probably want to leave them on). Disable areas of the screen, if desired. Using Guided Access to disable areas of the screen. Tap the top-right Start button to start Guided Access. Your kid will now only be able to use the current app. Feel free to give the device to your kid now! 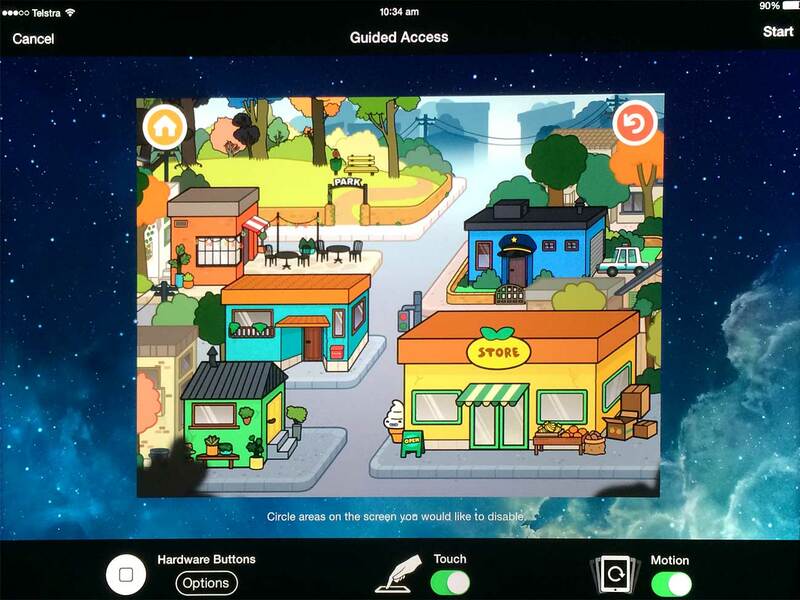 To stop Guided Access so that you can use other apps, triple-click the Home button again. Enter your Guided Access passcode, then tap the top-left End button. 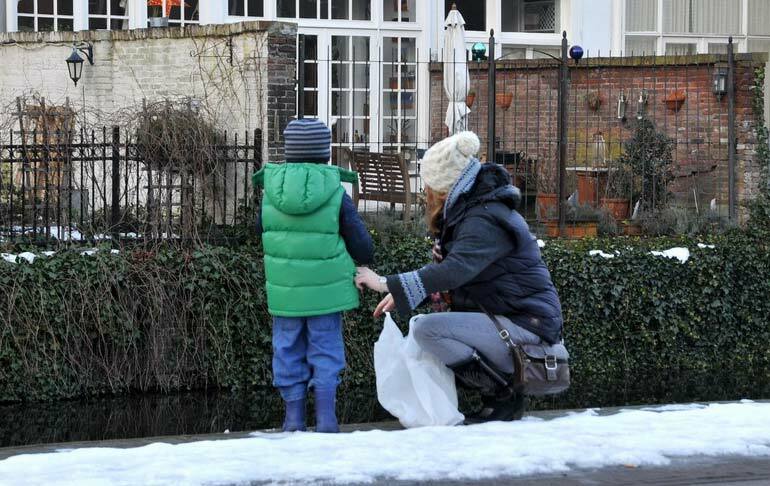 Is there a certain website — or a list of websites — that you don’t want your kid visiting? iOS’s Restrictions let you block websites so that your kid can’t visit them in Safari. To use this feature, first make sure you’ve enabled Restrictions as described earlier. Now open the Settings app and choose General > Restrictions. Tap the Websites button under the Allowed Content group. This displays a list of options: All Websites, Limit Adult Content, and Specific Websites Only. To block websites with the Limit Adult Content feature, add them to the Never Allow list. To be on the safe side, you might also want to add variants such as example.com and m.example.com too. When Safari blocks a website, you’ll see a message like this appear. Simply tap Allow Website, then enter your Restrictions Passcode to add that site to the whitelist. You can also add any safe sites you like by tapping the Add a Website… button under the Always Allow group in Settings > General > Restrictions > Websites. To remove a website from the Always Allow or Never Allow list, swipe left on the site and tap Delete. Bear in mind that this only works in Safari, so if the device has another browser installed then your kid will still be able to visit any website in that browser. Rather than blocking a website or two, you can take things a stage further and only allow access to a set list of websites. This is obviously safer than blocking sites, since you know that your child won’t be able to stray onto a new unsavoury website that isn’t in your block list. Using the Specific Websites Only feature, you can use — and add to — a whitelist of approved sites to keep your kid safe. Your kid can now browse only these websites in Safari; all other websites on the internet are blocked. If you don’t agree with Apple’s choices and want to alter this list, you can tap Add a Website… at the bottom of the list to allow another site. You can also remove a site from the list by swiping left on the site and tapping Delete. As with Limit Adult Content, note that this feature only works in Safari. If your kid uses another browser, they’ll be able to visit any website. What’s the most reliable way to prevent your child stumbling on content that’s too old for them? Don’t put that content on the device in the first place, of course! However, if you share your device with your kid then this can be inconvenient. 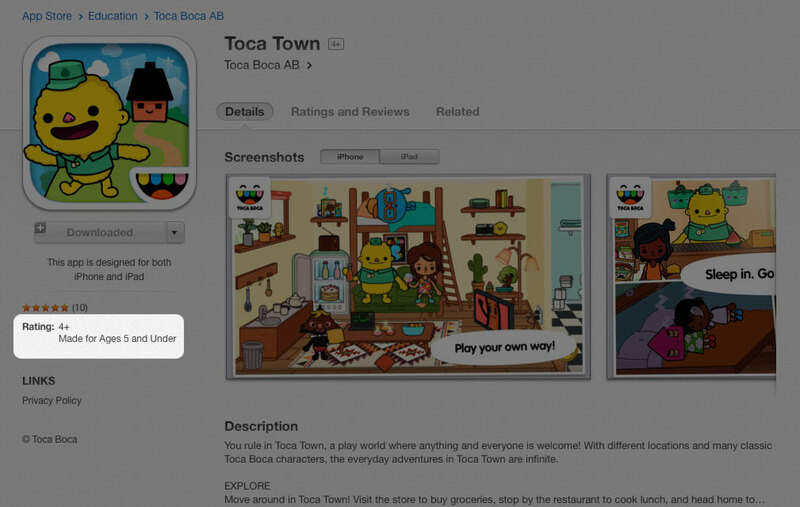 Perhaps you want to take a couple of grown-up movies with you to watch on a trip, but you don’t want your kid watching them when they should be playing Toca Town. No problem! 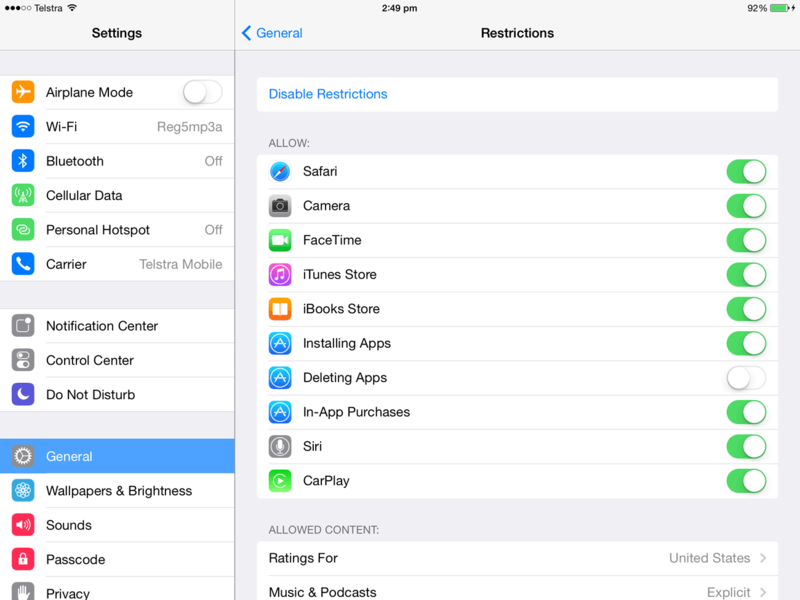 Restrictions in iOS allows you to set age limits on different types of content, from movies through to apps, TV shows, books and music. The Allowed Content group under Restrictions lets you set age limits for apps, movies and more. When you block content, it’s simply hidden from the device. For example, age-inappropriate apps vanish from the home screen, and movies disappear from the Videos app. To make the content reappear on your device, either select the appropriate “Allow All” option in the list, or disable Restrictions altogether. Siri, iOS’s virtual assistant, springs into life when you click and hold the Home button. Your kid can use Siri to dictate text, search the web, launch apps, and more. Keeping Siri polite with iOS Restrictions. 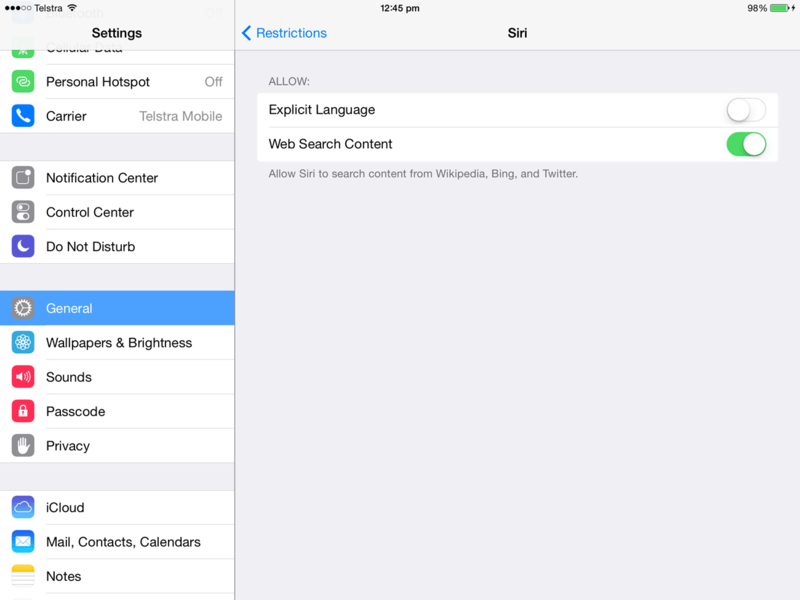 While you’re there, you can also prevent Siri searching the web by deselecting Web Search Content. If you prefer, you can block Siri entirely by turning it off in the Allow group in the General > Restrictions window. Look it up on Common Sense Media. Common Sense Media is an excellent database containing thousands of apps, movies and more. For each app, you’ll find a suggested age rating, a mini-review, and an indication of the app’s quality, helping you make an informed decision. If the app you’re interested in is even vaguely popular, chances are you’ll find it in their database. Check the app’s age rating in the App Store. 4+ is for apps with no objectionable content. 9+ apps may contain “mild or infrequent occurrences of cartoon, fantasy, or realistic violence”, and/or “infrequent or mild mature, suggestive, or horror-themed content” that may not be suitable for kids younger than 9. 12+ apps may contain more intense violence, as well as infrequent mild swearing and possibly simulated gambling. 17+ apps are for adults only, and can contain a lot of swearing, as well as frequent, intense violence, sexual content, drug use and so on. In addition, many App Store apps now include a target age range, such as “Made for Ages 5 and Under”, which can give you a good idea if an app will be appropriate for your kid. Look out for in-app purchases. Many apps these days include in-app purchases, where you can purchase additional content or pay to unlock extra features from within the app itself. 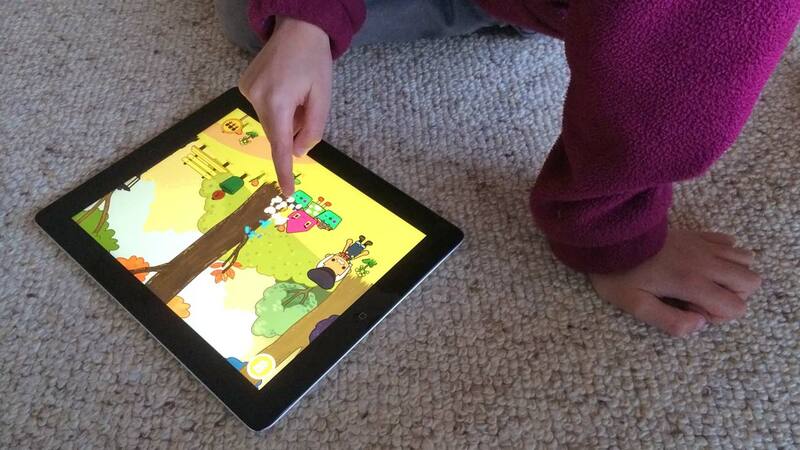 Depending on the type of app or game, you might find in-app purchases to be a problem. For example, if a game requires an in-app purchase to get past a certain level, or to buy more in-game coins, expect to be nagged incessantly by your child! To check if an app has in-app purchases before you buy, look for the phrase Offers In-App Purchases on the app’s page in the App Store. 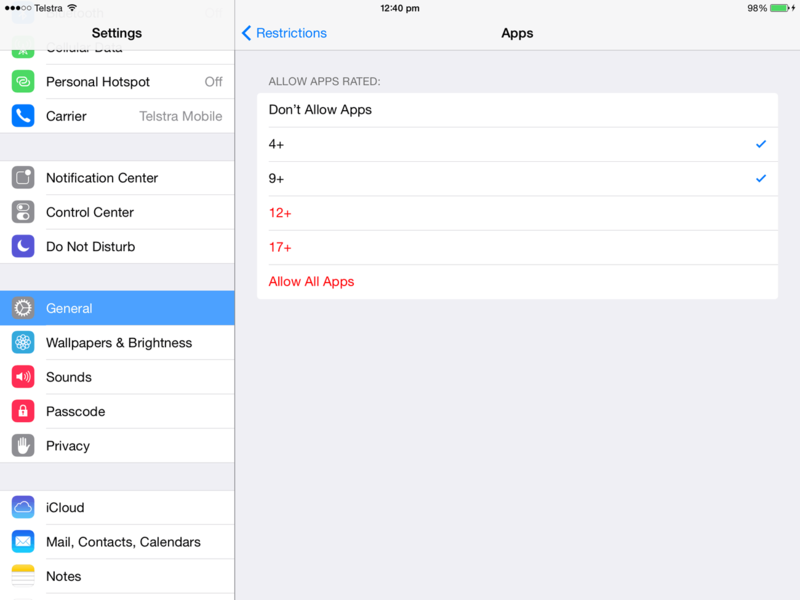 You can also block in-app purchases using iOS’s Restrictions feature. You’ll look at this in a moment. Check for email and message functions. Some apps and games include the ability to send an email or text message within an app, and currently there’s no way to disable this in iOS 7’s Restrictions. You might not want your kid sending random messages to your friends and colleagues! Often an app will mention such a feature on its App Store page, and Common Sense Media also often mentions whether an app has the ability to send messages, so take a look in those places if you’re concerned. Read some good app review blogs. There are many great blogs that constantly review new kids’ apps and games, and they can be a great way to find out if an app will be appropriate for your kid. Check out Apps Playground, Smart Apps For Kids and Best Apps For Kids, to name but a few. Web searching can be a bit of a double-edged sword with kids. On the one hand, it provides an easy way to find out information on any topic under the Sun. On the other hand, the search results can sometimes contain adult-related content that you’d rather your kid didn’t see! Assuming you’re using the default Google search engine in Safari, you can enable Google’s SafeSearch mode, which filters out most (but not all) adult content from search results. If you want to lock SafeSearch so that it can’t easily be turned off, visit your Search Settings page, click the Lock SafeSearch link, and sign in with your Google Account if necessary. To enable Google SafeSearch, visit your Search Settings page and select the “Filter explicit results” checkbox. If your kid mainly uses the device for playing games and using apps, the safest option is to disable Safari so that they can’t surf the web at all. To do this, open up the Settings app, choose General > Restrictions, and turn off Safari in the Allow group. When it comes to keeping your kids safe on the internet, YouTube can be a big problem. If your kids are anything like mine, you’ve probably found them watching something they shouldn’t on YouTube at least once! YouTube has a Safety Mode that can filter out inappropriate videos from searches and suggestions. It’s not foolproof, but it’s better than nothing. As with Google SafeSearch, by default this setting is only temporary; if you want to lock Safety Mode, log into YouTube on the device using your Google Account, enable Safety Mode, then follow the “Lock safety mode on this browser” link at the bottom of every YouTube page. To filter YouTube, press the Safety button at the bottom of any YouTube page, then turn Safety Mode on. To prevent access to YouTube entirely, you can use iOS Restrictions to block youtube.com, www.youtube.com and m.youtube.com (see “Block a specific website” earlier in the chapter), and remove the YouTube app if you’ve installed it. Meanwhile, Google is reportedly developing a version of YouTube for kids, so keep an eye on that one! Always require a password for purchases. Make sure that your Apple ID password is always needed for purchasing apps and other content. To be on the safe side, you may want to disable all purchases on the device. To do this, open the Settings app and choose General > Restrictions. In the Allow group, turn off iTunes Store, iBooks Store, Installing Apps, and In-App Purchases. As a last resort, you can always remove your payment method from your iTunes Store account. No credit card means no purchases! Younger kids often inadvertently delete apps from mobile devices. This can be doubly annoying if your app had a lot of saved data, since it will all be deleted along with the app! To prevent your kid deleting apps from the device, open the Settings app and choose General > Restrictions, then turn off Deleting Apps in the Allow group. Turn off the Deleting Apps setting to stop your kid deleting apps from your device. By default, it’s possible to allow iOS apps and games to upload quite a lot of personal content onto public servers, including the device’s location, contact details, photos, and sounds recorded with the devices microphone. Naturally you want to be careful about what information your kid is sharing with the world. Location Services controls which apps can access the device’s location. Contacts controls the apps that can use the contacts on the device. Calendars determines which apps can access your calendars on the device. Photos controls access to the photos taken and stored on your device. 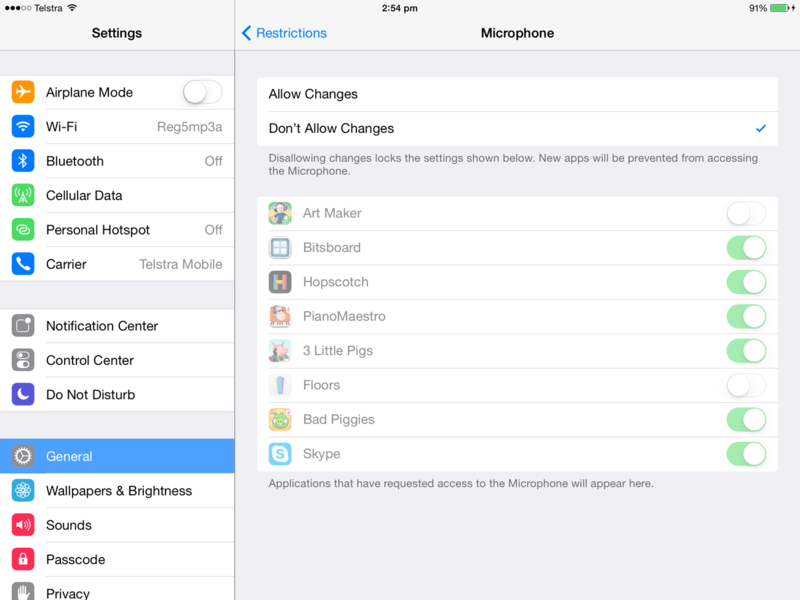 Microphone controls which apps can access the device’s mic and record sound. You can use the Privacy restrictions to control which apps have access to features like photos and the microphone. In addition to the above privacy settings, you may also want to disable both the camera and FaceTime chat to prevent your kid uploading pictures of themselves or video chatting using FaceTime. To do this, turn off both Camera and FaceTime in the Allow group under General > Restrictions. If they happen to wander into the iOS Settings app, it’s fairly easy for your kid to wreak havoc with your mail, contacts, calendars and iCloud accounts. They can mess around with the account settings and passwords, or even remove the accounts from the device. Use General > Restrictions > Accounts to lock down your mail, contacts, calendars and iCloud account settings. When you do this, a little lock icon appears next to the Accounts button, and various other sections in the Settings app, such as iCloud, the Mail accounts, Messages and FaceTime, become greyed out. 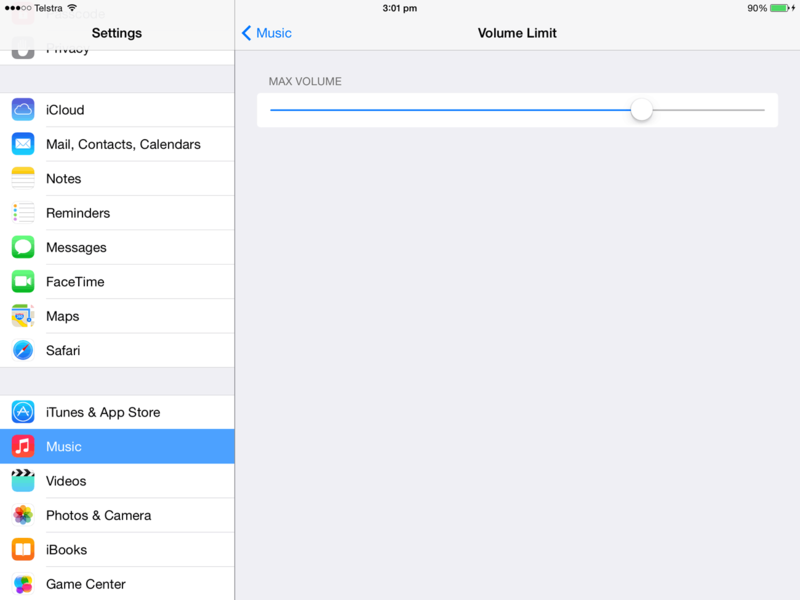 Set and lock your device’s volume limit to protect your kid’s hearing. Once you’ve done that, you can lock the volume limit so that your kid can’t bump it back up again. To do this, choose General > Restrictions in the Settings app, then tap the Volume Limit button under the Allow Changes group, and select Don’t Allow Changes. Turn off Multiplayer Games to prevent your kid requesting a turn-based game match, sending or receiving invitations to play games, or adding new Game Center friends. Turn off Adding Friends if you just want to stop your child making or receiving friend requests. They can still play with existing friends if Multiplayer Games is turned on. iOS’s Restrictions let you control the social aspects of Game Center. Device usage in the open. As with TV and computers, it’s best to make sure your child uses the mobile device in a place where you can keep an eye on them, if possible. This means using the device in the living room, not under the blanket in bed! Keep the device locked. Set a passcode that your kid doesn’t know, or set up Touch ID with just your fingerprints. That way, your kid has to ask you to use the device, making it easier for you to keep an eye on things. Keep an eye on how your kid is using the iPhone or iPad. Setting limits on content. Explain clearly what types of websites, videos and apps you’re happy for your kid to use, and what types you aren’t happy with. Setting limits on screen time. Talk about why it can be good to limit screen time; for example, it frees up time to do other stuff, like exercise, reading and playing with friends. Teach them to find their own limit. Many kids start to “zone out” after too much continuous time on a game. Teach your kid to recognise when they’re getting tired or bored, so that they can take a break. Explain online safety concepts. Discuss why you have to be careful about sharing personal information online, and talk about how not all content online is suitable for kids. Talk about different ways of using devices. Some ways can be more useful and fun for your kid than others; for example, building a city with a friend in Minecraft: Pocket Edition will probably be a lot more fulfilling than simply watching Lego Star Wars gameplay videos on YouTube! Talk to your kid about safe ways to use computers and mobile devices. 18. Follow Brightpips to keep your kid safe! Here at Brightpips we regularly publish articles on kid-friendly and kid-safe apps and websites, and talk about different ways to keep your kid safe and happy online. To keep up to date on the latest news and articles on kids, technology and safety, you can follow Brightpips on Facebook, Twitter or Google+, or subscribe to our regular newsletter using the form below. I hope this article has given you some ideas for keeping your kid safe on iPads and iPhones. If you have any other suggestions, I’d love to hear them in the comments below! Also, if your kid plays Minecraft then you might also like to check out my list of kid-friendly Minecraft YouTube channels, as well as my list of family-friendly Minecraft servers where your kid can play safely online. I’m loving common sense media. I didn’t know about it before, but it’s already proving really useful! Thanks! We block the app store totally … because even when you block apps based on age, the kids can still go to the app store and see the inappropriate apps. True the ‘buy/get’ is greyed out, but they can still see the apps. I’d like to see the app age restriction, block them from even seeing the apps on the app store. Thanks for your comment Paul. That’s a good point! iPad doesn’t have a time limit system built in. You could maybe set up your router to block access to certain sites after 9pm, and there are also third-party apps that can block online access after a certain time. However, I don’t think there’s an easy, software-based way to limit your kid using the iPad offline (games etc). We have a rule with the kids whereby they need to stop using screens at least 1 hour before bed. With my 7-year-old, I showed him a video on YouTube where a doctor explained how screens keep you awake at night, and that was enough to convince him! The true short answer to the titular question is: NO. The iphone is NOT kid friendly so long as you cannot prevent contacts from being added. This is truly the MOST significant feature of a PHONE. The ability to control WHO calls/texts/facetimes your child and when trumps any other considerations. There is no combination of settings that restricts adding contacts. Another phone will have to be used. Licia…I was recently introduced to a great parental app called OurPact. I gives you complete control over when your child can play games. You have immediate access to block the ipad or you can create a schedule when the games come on and go away. Anyone know how to prevent the exchange of photos though texting? I would like my kids to be able to use their phones to text but not to send or receive pictures?